The sun is shining through the clouds and we have a good course to the Cape. I have made myself some tea and had an orange. I also went to wipe something off the cabin sole and that started a cleaning frenzy that lasted about 30 minutes, so things are nice and fresh and drying out. I have been looking at my course and the wind Ron has forecast for the next few days and it all looks good for us. 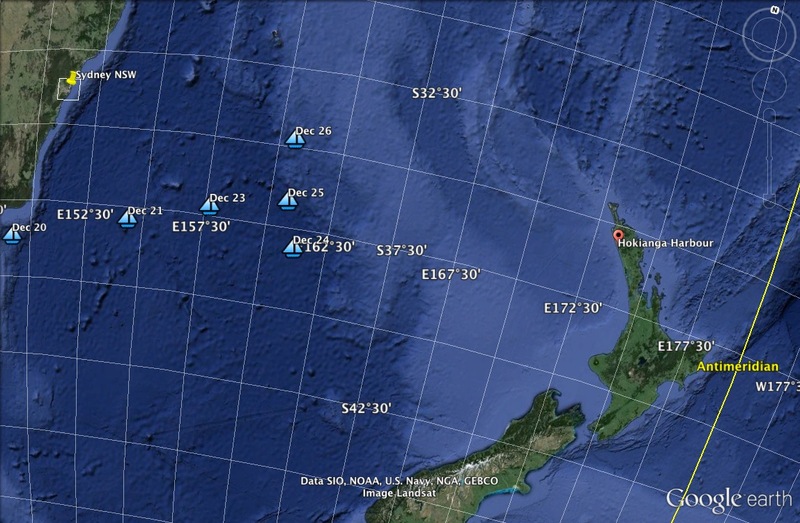 Just to put things in perspective my latitude is the same as Hokianga Harbour which is 90 miles “north” of Auckland. This is very good and a long way from where we were Wed at noon! There is a certain amount of optimism in the cabin this morning knowing I’m sailing directly towards you lifts my heart and puts me in a lot better space than I was last night. Started to settle in for the day here I have propped up a couple of cushions and made a comfortable nest to read in. New book this morning “Never Fly Over An Eagles Nest” by Joe Garner. About a southern family who escapes the south and ends up in Victoria. True story and from the first few pages more than enough to keep my mind occupied for the next few days which will be a good distraction. Still making good time in relative comfort. Editor’s happy note: This blog post is coming to you from Waiheke Island, not a bad place to hang out waiting for your sailor to arrive. Happy Christmas to you and your family. We are enjoying the posts and hope you are all reunited soon. Thanks you two and to you too. Woo hoo! Not soon enough, but soon. All the best to you both. DO HAVE A BOTTLE OF ‘ MAN A’ WAR ‘ ,ON WAIHEKE . THE VINEYARD IS ON THE VERY NORTH OF THE ISLAND,& IS VERY GOOD. WORTH THE DRIVE , IF YOU GET TIME. A/E , E.
Hi GandM! ML, you better be sailing back home together, izzall I hafta say about it, fee shure! Absolutely…at least one leg of it anyway. Cheers and thanks for your comments Alan. Much appreciated.